Last month, 800 dogs were intercepted after being packed into 100 cages without food or water for three to four days. 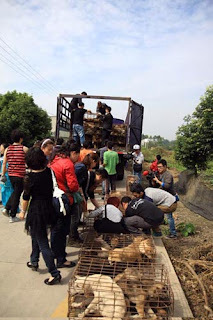 The dogs were headed to slaughter in Guangxi, but were stopped by suspicious residents in Zigong, Sichuan.This is the second occasion this year that residents have showed their concern for the animals headed to slaughter. Thanks to them, more will be done to protect companion animals from slaughter and the illegal meat trade. Not only is the slaughter of these animals horrible, but so is their long transport to their slaughter. After veterinarians conducted examinations on the dogs, they found the animals were in worse condition than they could have even imagined. The dogs were dehydrated and suffering serious fractures and trauma. They were also infected with diseases, such as canine distemper and Parvovirus as well as other serious illnesses, that could alone take their lives. So far, 27 of the 800 dogs have died. 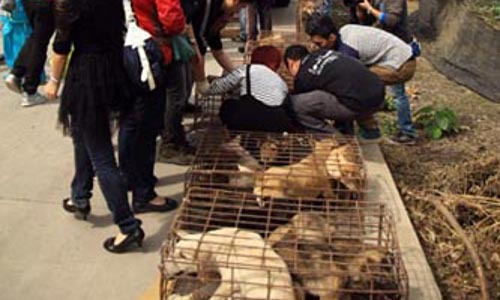 IFAW continues to grow concerned about the ongoing situation and is going to step in to strengthen dog protection laws in China. IFAW addressed a letter to authorities, asking to strengthen existing regulation to protect companion animals from the illegal meat trade. They also advocate for the anti-cruelty legislation to protect all animals, both dogs and cats. Dogs are meant to be pets, not meat. Hopefully this sick practice will end soon enough, and every dog can escape the dinner plate.